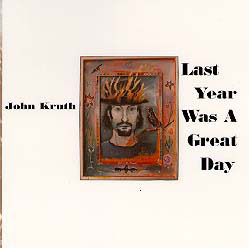 John Kruth"Last Year Was A Great Day"
Known to many for his contributions to albums by Rod MacDonald, Gideon Freudmann, and others, Kruth was a long-time Greenwich Village denizen who relocated to his native Wisconsin, teamed, hung out with the Violent Femmes, and produced this remarkable collection of odd pop classics about a gargoyle girl, the world's worst roommate, Marlon Brando, the blonde John Lennon and other "characters." Guest appearances from Gordon Gano of The Violent Femmes and former Garbage bassist Mike Kashou. Prior to this release Kruth released two critically-acclaimed independently released albums as well as several small humor books.